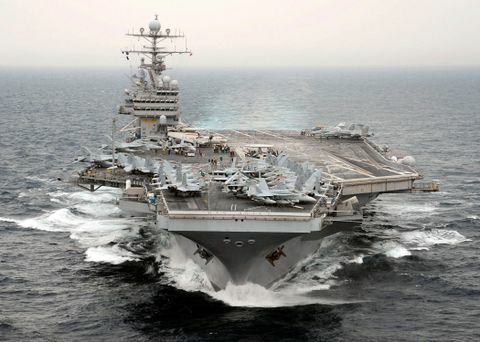 NEWPORT NEWS, Va., Aug. 26, 2009 -- The U.S. Navy has awarded Northrop Grumman Corporation (NYSE:NOC) a contract valued at approximately $2.4 billion for the refueling and complex overhaul (RCOH) of the nuclear-powered aircraft carrier, USS Theodore Roosevelt (CVN 71). The work will be performed by the company's Shipbuilding sector in Newport News, Va. and will include the refueling of the ship's reactors, as well as extensive modernization work to more than 2,300 compartments, 600 tanks, and hundreds of systems. In addition, major upgrades will be made to the flight deck, catapults, combat systems and the island. The carrier is scheduled to arrive at the shipyard this month. "During this large and complex project, we'll touch almost every part of the ship," said Jim Hughes, Northrop Grumman Shipbuilding's vice president of aircraft carrier overhaul and fleet support. "As in the past, we look forward to working with our Navy partner to meet quality, cost and schedule commitments as we increase and modernize Roosevelt's capabilities to return her to the fleet for another 25 years of service." Work is scheduled to last more than three years and will be the ship's one and only refueling and complex overhaul in a 50-year life span. USS Theodore Roosevelt is the fourth ship of the Nimitz class to undergo this major life-cycle milestone. More than 3,800 Northrop Grumman Shipbuilding employees will be working aboard the carrier during peak periods of the project. Launched in 1984 and delivered to the Navy in 1986, USS Theodore Roosevelt is the fourth Nimitz-class carrier built by Northrop Grumman, the nation's sole designer, builder and refueler of nuclear-powered aircraft carriers.